I spent some time making some changes to my blog today. I added a list of blogs I follow. I joined a few more social network services and found a new widget to add to my blog showing all the accounts I have all over the place. This is my personal blog. It serves as an online journal or diary for myself and my friends. I don't mind sharing it with the world, but know that it is mostly of interest to those who know me. Still, I guess part of my effort today was to build up some more traffic. Blogging takes some effort. At least here it is fairly easy to find things to post about. Sometimes it is harder to find decent content for my other blog and web sites. About a year ago our Boy Scout Troop had to temporarily relocate to a new meeting place. The church that charters our troop started a major remodeling project. Not only did we have to find a place to meet, but we also had to find a place to store all of our gear since the remodeling project would involve all three sheds/closets that the troop tucked gear into. But all that is coming to an end as construction is nearly complete. This morning a number of people from the troop met to rebuild our shed. We have a fancy new room to store our gear with finished walls and a lot more space. It even has a window. There is enough space that all of our gear can be consolidated into the one room. One of the first tasks is to rebuild all the shelving and storage. So we spent the day working. The boys made six dollies so that their patrol boxes can be rolled in and out of their storage slots in the new shed. I helped supervise that process. While the dollies were not the finest of construction, they turned out very serviceable and should last a number of years. The boys learned some good wood working skills too. The men who have carpentry skills spend the day putting up shelves and cabinets in the new shed. I expect we will be adding lots of hooks and other aids for storage. My wife, daughter, two sons and I got up early Saturday morning to put out flags and religious emblems on the graves of veterans for Memorial Day. My oldest son was invited for a service project as part of his membership in the Boy Scouts of America Order of the Arrow. My daughter needed another service project for her membership in the National Honors Society. The rest of the family came along since we like doing things like this, and have put out flags for veterans numerous times over the last 6-7 years. Memory Garden is a much smaller cemetery than we have been used to working. We expected it to take all morning, but it didn't take long at all. We arrived around 7:00 A.M. and we finished around 8:30 A.M. We finished up the morning with donuts and coffee. My daughter had an end of the school year recital. I thought she did well. 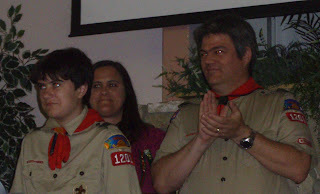 Andrew was awarded his Tenderfoot rank at Spring Court of Honor. The boys did a great job and the even went very smoothly. The Los Amigos District Scout-O-Rama event was held this weekend. Scout-O-Rama? What's that you say? I wondered the same thing when I heard about it many years ago when my oldest boy had joined a local cub scout den. If I had attended it back when I was a boy, I do not recall. Scout-O-Rama is a special annual event where all the units in the district come together to display scout skills. I'll say that it is something like a carnival/fair. Every unit (Cub Scout Packs, Boy Scout Troops and Venture Crews) get a booth or display area. There is a nominal admission fee of $10 per family which mostly covers rental of the grounds and insurance, and there is typically a parking fee charged by the facility owner which was $5 this year. A few vendors are invited to supply food and beverages, the scout shop sets of a store, but otherwise there are no additional fees to participate in anything. An excellent deal, but it get's better! Some cook and serve food (typically camping style) which you eat at your own risk, though most of it is from very safe recipes. Food includes stews, muffins cooked over open fires, dutch oven cobblers and desserts, solar cooked wienies and even pizza. I never have a need to buy food from the vendors. Scout built bridges, towers and climbing walls, as well as a regular attraction of a scout built May-Pole swing that seats about 10-12 people per turn. The swing often has hour long lines to get on. Booths to earn Cub Scout Belt Loops, Webelos Pins, and Boy Scout Merit Badges. These usually entail completing a number of requirements. The units usually provide the materials needed to complete the tasks. Crafts and art booths. In the past, the pack my sons belonged to provided materials to build pine cone bird feeders, a very popular activity. Cheap peanut butter spread on pine cones collected from local parks then roll the pine cones in bird seed and add a string to hang it. A few booths specialized in providing shaded resting places or misting stations or cold drinks. Many other things I am probably forgetting including panning for gold or fancy rocks, mazes, displays and exhibits. My son's Boy Scout Troop 1201 has traditionally run a canoe event. We brought 6 canoes and provided canoe rides. My sons and I worked the booth from 11:00 am to 1:00 pm and I have included a picture of my younger boy helping me unload passengers I just took around the pond. This is a very popular booth that has had two hour lines in the past. It is great advertisement for our troop. We even won an award this year. We only had one incident during the day where a canoe tipped over and dumped the passengers. Accidents happen, and the life jackets we make everyone wear is a clear indication that unexpected dips in the pond are a distinct possibility. With that one exception, I think everyone else had a nice time. I have to say that the location of this years event was by far the best; much better than the two other locations that have been used in past years. There was lots of shade and parking was good, taking less than 15 minutes to get in and out. I hope the district will be able to use this same location in coming years.